Suzan-Lori Parks’ Pulitzer Prize-winning tragedy Topdog/Underdog is one of the most powerful dramas in the American theater. Acclaimed for its taut theatricality and surprising humor, the play tells the story of two brothers, Lincoln and Booth—names given to them as a joke by their father, as they grapple with what it means to be brothers and to be African-American today. 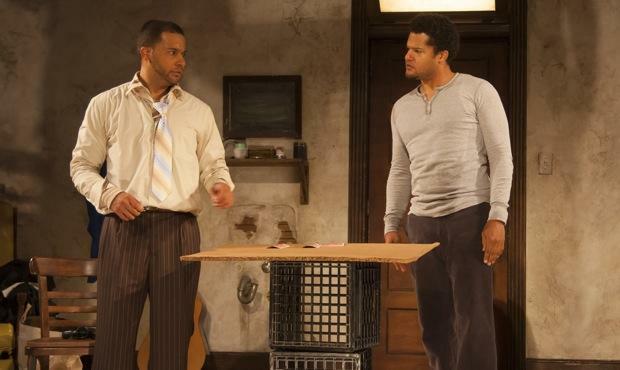 This production stars real-life brothers Brandon J. Dirden (The Greene Space’s Their Eyes Were Watching God: A Radio Drama, August Wilson’s Jitney at Two River, Broadway’s Clybourne Park) as Lincoln, and Jason Dirden (2010 Broadway revival of August Wilson’s Fences) as Booth. We will be joined in The Greene Space by Pulitzer Prize-winning writer, Suzan-Lori Parks and Brandon and Jason Dirden, and artistic director of Two River Theater, John Dias for an Inside Look at this production. Hosted by WQXR’s Elliott Forrest.